This is the last post in the 14 article series about that trip and its planning and how type 1 diabetes played a part. The previous posts are full of facts and viewpoints but this one is the most important, it’s the story from Amy about what she remembers about the trip and adjustments she had to make. 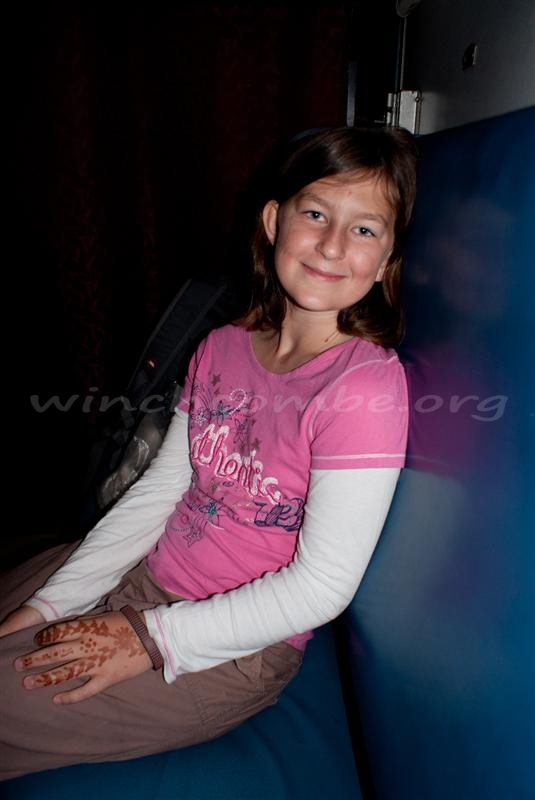 I’m 12 and I was diagnosed with type 1 diabetes on 29th December 2010. My family and I were already planning to go to India the following summer and we were going to go to Ladakh which is in the Himalayas. 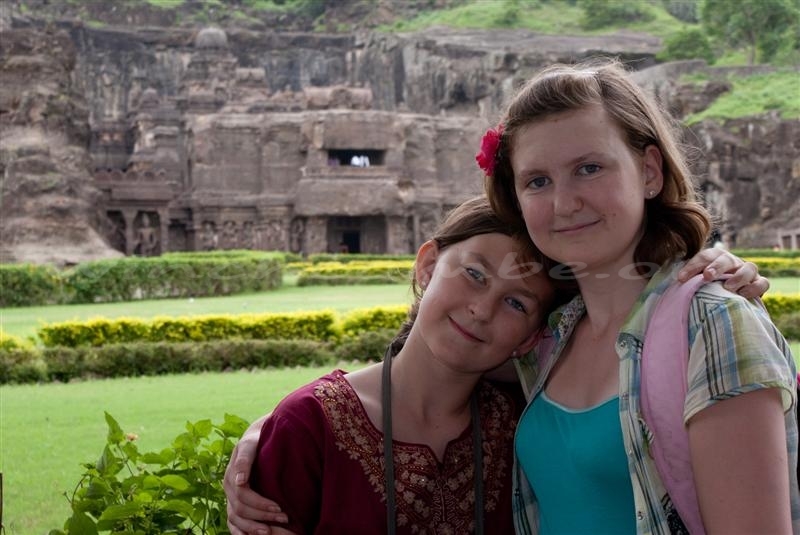 After I was diagnosed my parents quickly started to wonder whether we should go to India or not. Through his research Dad had found out that getting altitude sickness was a real possibility on the two road trips through the mountains and he wasn’t happy about dealing with that at the same time as diabetes, both of which we knew nothing about. So it was decided, we would not be going to India that year. Thinking back now, they were probably trying to figure out how to break the news, when they heard me say to the doctor “Does this mean I can’t go to India any more?“. It was this that changed their minds. We were going to go to India (even if we went somewhere different) and nothing was going to stop us. Whilst thinking of an alternative trip my Dad tried to think specifically what I liked the most about India; it was trains. He decided that we should go on lots of them, just for me. Altogether we travelled around 2700 miles on just 8 trains and the trip was organised all by ourselves! No help whatsoever from travel agents or such. We saw monuments, holy places, tombs, caves, palaces, trains, beaches, cities and we even went to a waterpark – we were the only ones there! How cool is that!? All of that for a whole month. I have been to India once before – before diabetes – and I loved going on the plane so I was really excited about going on it again, but I was worried about the injections and the food. Before it came to mealtime we told the staff that I was type 1 diabetic and they went and found an apple for my pudding. Also they gave me my food first in case I had to count carbohydrates (which at that point I didn’t because I was still in my honeymoon period but it was still very thoughtful of them). When it came to injection time I was worried and didn’t know how we would do it, but my mum, who was sitting next to me, set it up and did it in my arm and the best bit was I didn’t even have to get out of my seat! Trains are exciting because I barely use them in England and there’s very few sleeper trains, which I love. A sleeper train – clue’s in the title – is a train which has padded benches for you to sit on during the day, which then turn into beds for during the night. India has so many of these because the distances are so great, some trains go for three whole days from start to finish. 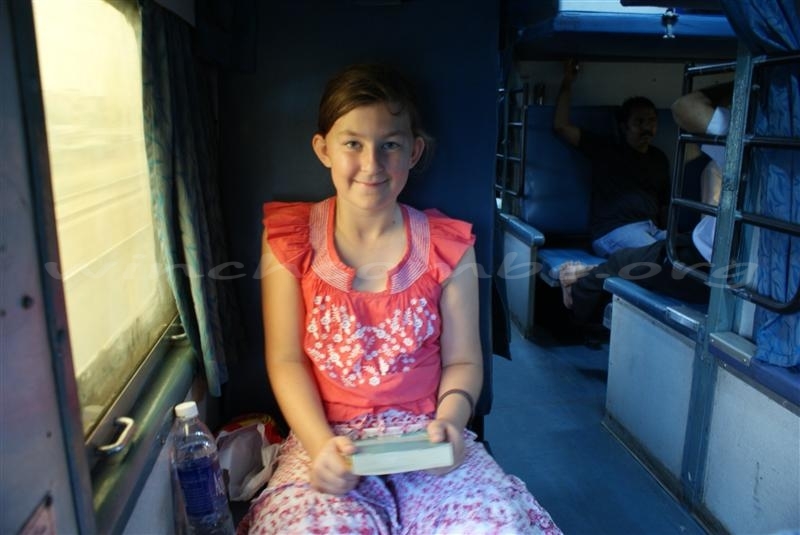 We travelled thousands of miles across India by train using upper class, middle class and lower class trains. The poshest train was from the capital city (Delhi) to Amritsar (the hottest of the places we went). We had padded, reclining seats and were served meals by waiters in traditional Indian uniform, it was the fastest train we took. I don’t like any distractions when I do my injections at my house so I have to have the light on full, have everyone completely still, have no talking or T.V and no cats moving in the room. So when I did the injections on the trains I had to adapt but everything went well as we came up with an awesome method. First we would wait until we were near a station, then when the train stopped I would have my injection ready to whip out and do. If I did it as soon as the train stopped, then I would be sure that it wouldn’t start to move whilst I was in. But I love trains, and I wasn’t about to let diabetes ruin them for me. 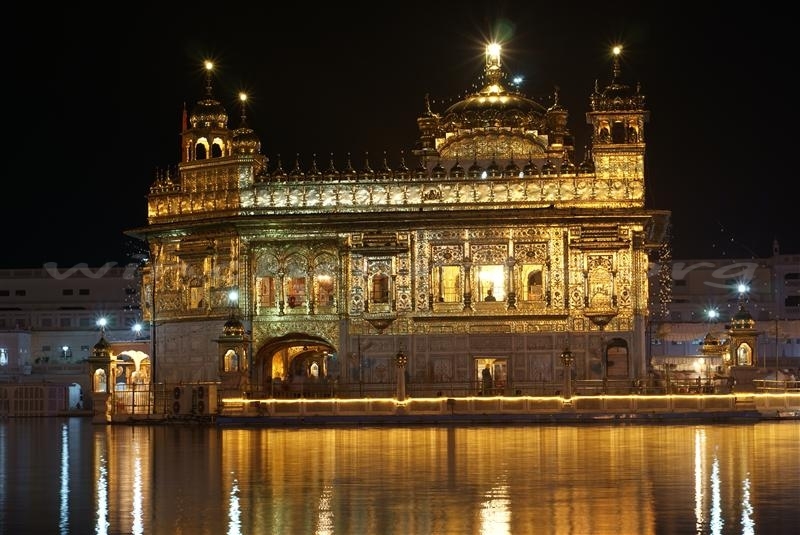 Whilst at Amritsar we saw the stunning Golden Temple and we witnessed the weirdest ceremony ever (video) – where they close the border gates between Pakistan and India. There were men dressed in Indian army suits with stupid fans sticking up on top of their turban! 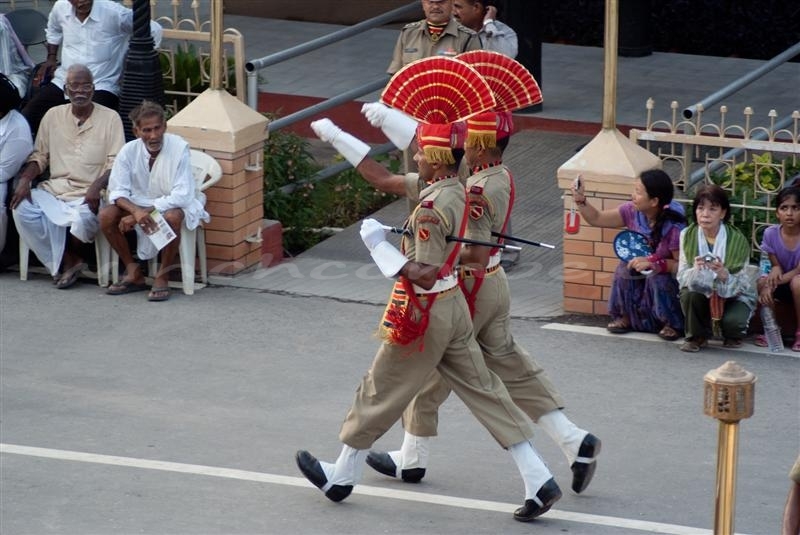 There were people running up and down the road and when they got to the Pakistan border, they waved the Indian flag in their faces. As the border closed the soldiers goose stepped up to the gate and almost stuck their tongues out at the Pakastani soldiers, however it was all in good humour…or was it? 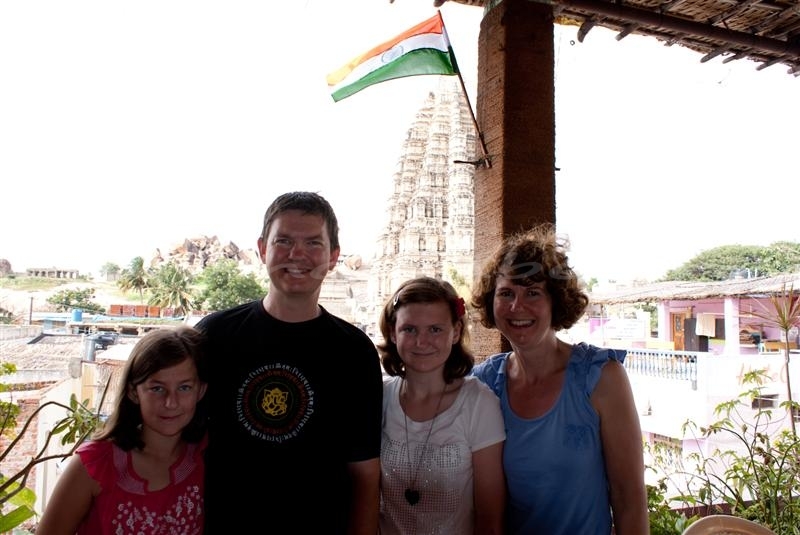 One of the many adventures that we had in India was going to live in a Homestay. This is where (clue’s in the title again) you stay in one of the local’s homes. We knew that we were going to the Homestay and that they’d be poor, so we decided to bring our old clothes and school uniforms. We gave it to them and although they were girls clothes, and our hosts only had boys, they took them gratefully. We also gave them a frisbee and a bat & ball which they loved and they taught me a new game that I can still remember now. Coming back to the diabetes side of it, I did my injections after my meals because I decided three days in to the one month trip that I didn’t like India food any more. What a fail. It turned out that it was just one thing – paneer, a type of cheese they use in curries – which I’d gone off. Another place we went was Hampi which looks as though a giant has scattered some pebbles (what we would call boulders) in totally random places. 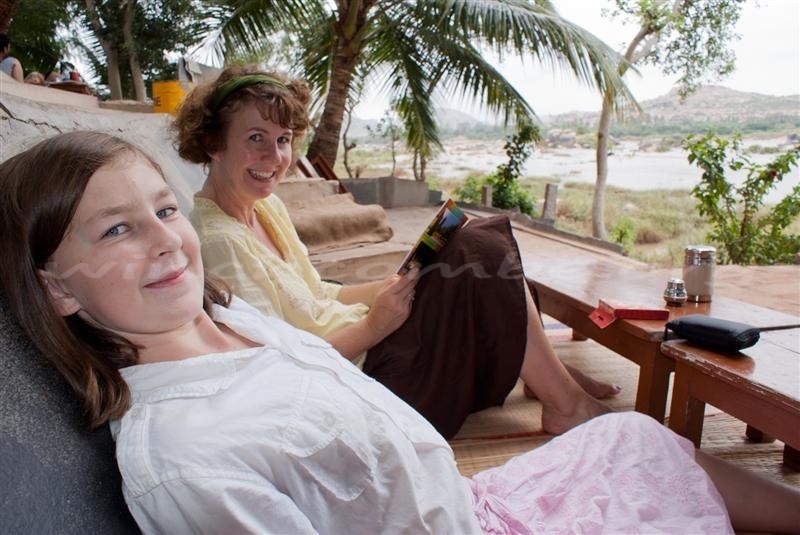 Hampi is a small village with lots of huge rocks randomly placed around the landscape. 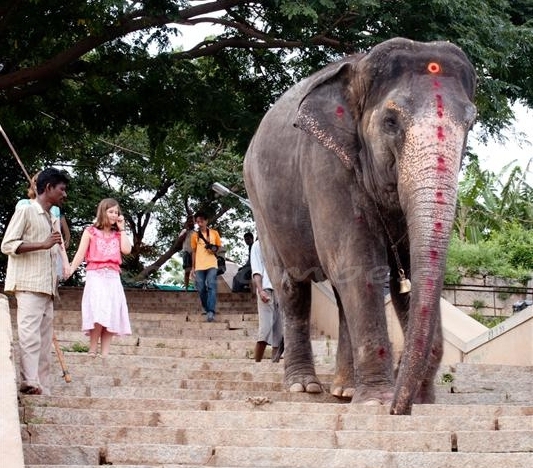 It has a many temples, a market, a river and plenty of places to stay. It was so beautiful. Kolo-kolo Kololu Kololu Kololu Kolo-Kolo Kololu Kolo Kololu. The music man was called Gali and he taught me to play the Kololu (think of a flute then turn the buttons into holes and make it wood) for free. I decided to buy it but we didn’t have the money with us right then so he said take it and pay me back tomorrow which was really nice of him as he didn’t really know us. 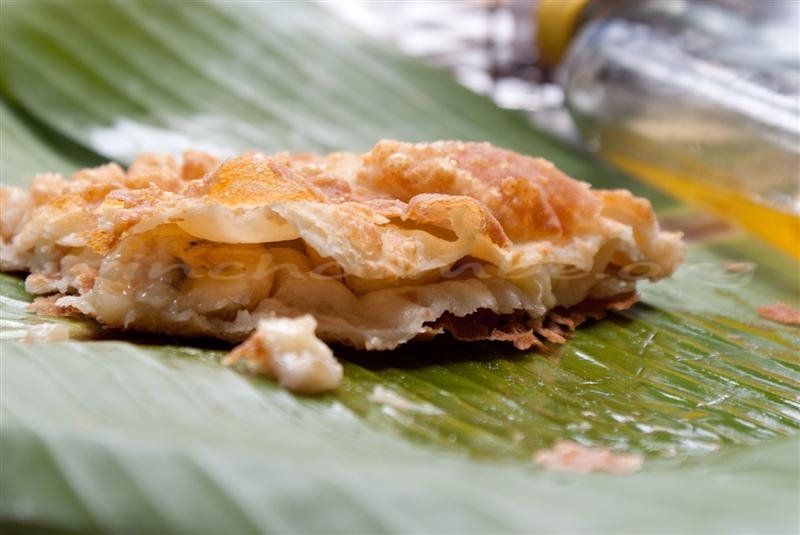 There is only one word that can describe The Mango Tree; magical. The Mango Tree is a cafe/restaurant where you can sit outside to eat and watch the river and all the wild life around it. The Mango Tree was a little walk away from where we were staying but it was worth it. 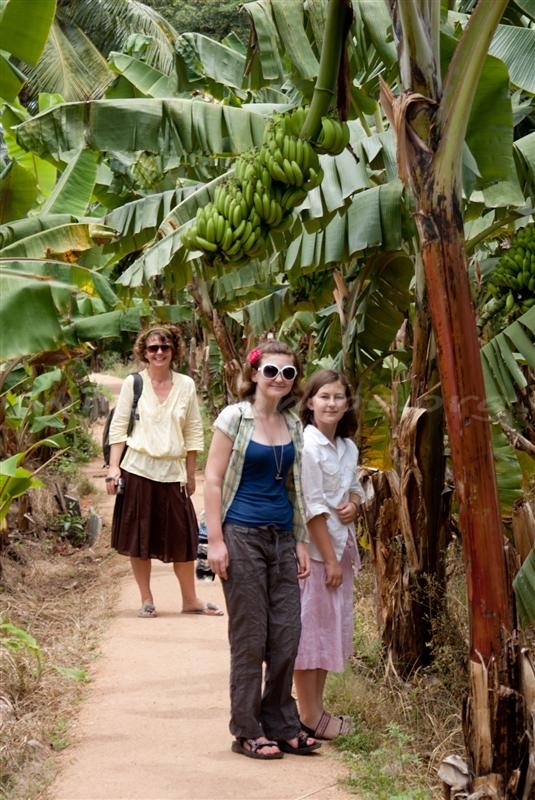 We had to walk through a banana plantation and when we got there I had a Banana Paratha and a Banana Milkshake. We sat on the straw mats on the floor and waited for our food and then I spotted a Kingfisher in front of the river! 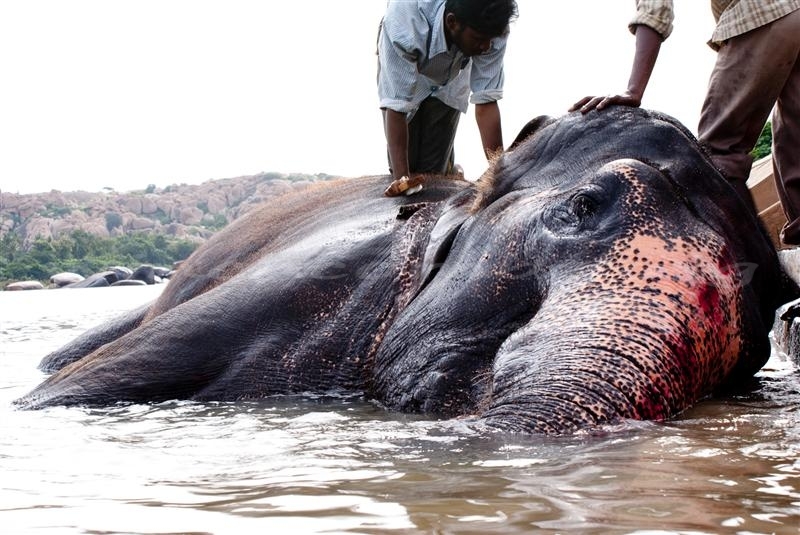 Talking of animals, one day in Hampi my family and I went down to the river to see Lakshmi the Elephant having a wash. It was funny because they asked if anyone wanted to be blessed by Lakshmi and my mum was determined to, but when she saw that actually it meant she would have to go in the river and get a full soaking of water from Lakshmi, she decided not to. As I said earlier, I have been to India twice, and last time I went, we went safari-ing and we saw many animals including an Indian Rock Python and a Tiger chasing a Wild Boar! 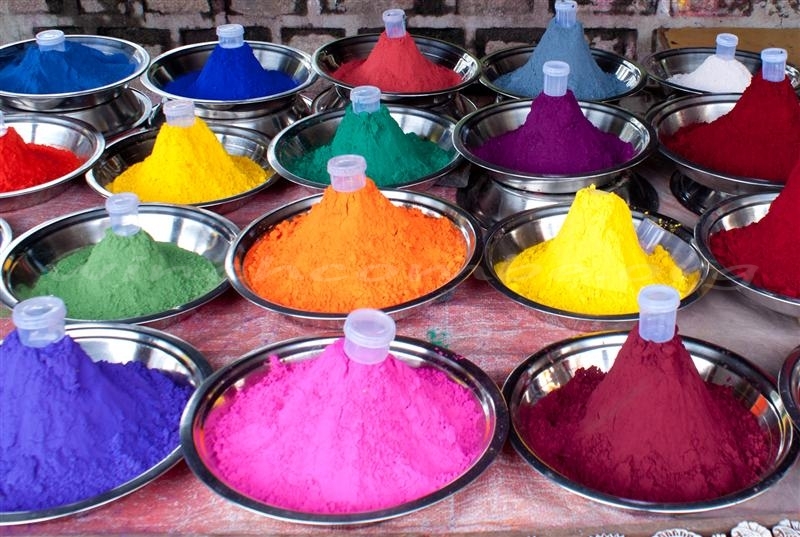 One of the many things that India is famous for is Henna. 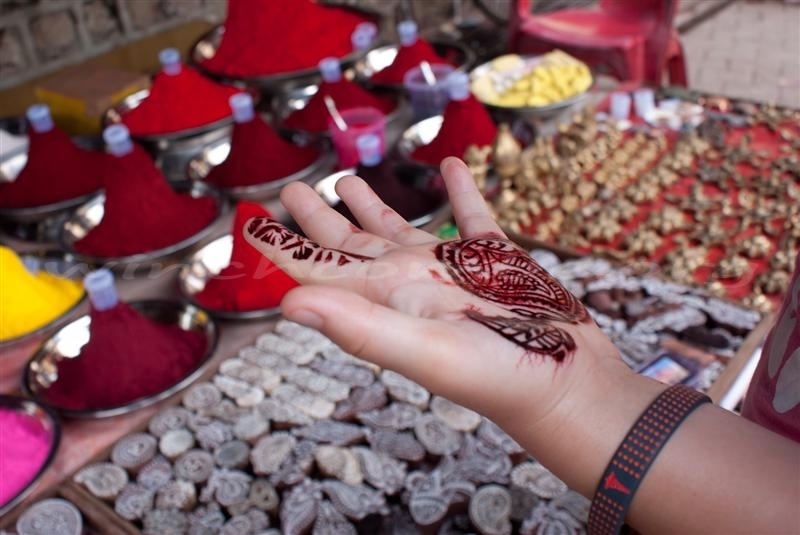 Henna is an ink which is used to draw a pattern onto your arms or legs. It stains your arms or legs until two weeks later when it eventually fades away. 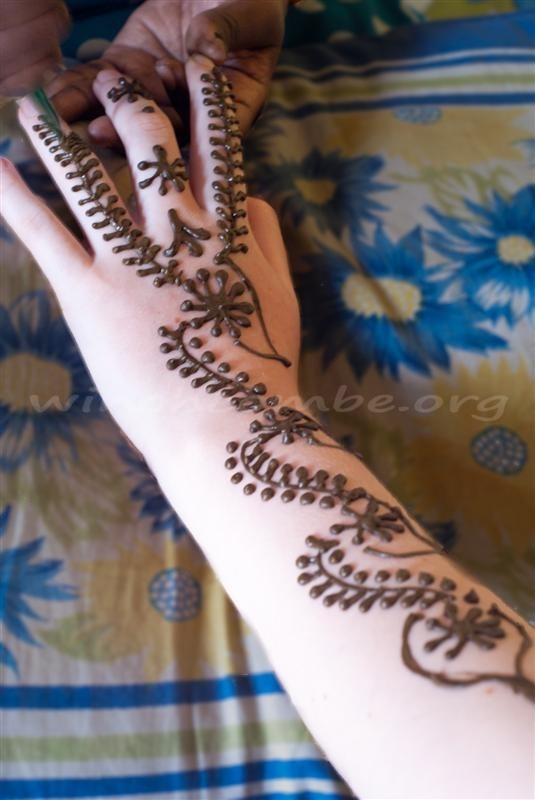 Generally it is used for women on special occasions such as their wedding day however when I was out in India I got my Henna done within the last week so I could show my friends. I had it done on both my arms and I bought some Henna powder so I could make some more at home, and I still have it after one and a half years. Thank you for reading about my adventures, I hope my story makes you realise that diabetes doesn’t have to stop you doing things you want to. I was in two minds about going back to school: I wanted to see my friends as I hadn’t seen them for ages but I had several concerns about dealing with diabetes at school when my parents weren’t around. When I went into class on that first day I was escorted by one of the office ladies who told my teacher about diabetes. I didn’t think it was that serious. That morning we did an activity where you had to write down your New Year’s resolutions and then if you wanted to you could read them out. As I didn’t care if everyone knew or not, I wrote and said “to do all my injections properly”. Now, I wish I hadn’t because that meant I had to tell everyone in my class I had diabetes. I didn’t care about everyone knowing, not then anyway, but now sometimes I wish that not everyone knew as I don’t want them to think of me as a diabetic first and a child afterwards. Daddy says people see me for my personality first, not diabetes, but I’m not sure. I wanted Mummy or Daddy to do all my midday injections with me but it was hard as they both had to work. My mum works at a pre-school quite close to my school therefore it was always her that had to come in for an hour during lunch. I was very happy that she could come in, so you can imagine how upset I was when she told me that she couldn’t do it on Thursdays. For the first couple of Thursdays Daddy come in to do the injections but he couldn’t do it forever as his work was 30 minutes drive away. I said to Mummy that she would keep saying the same for the other days until eventually she wouldn’t come in at all. And I was right. I started doing the injections with the office ladies, but I wanted my Mum. I felt like I had to control diabetes all by myself. I was scared. Luckily for me I have a lovely set of friends and that meant that this disease would not affect our friendship. All my friends volunteered to go to lunch early with me (out of kindness, not just because they wanted to go to lunch early) but I could only pick one, so they took it in turns. I am so glad my friends stayed by my side, it didn’t even occur to me that they might ditch me as a friend and it would have been a very big shock if they had. Where’s my P.E. (Physical Education) class gone? I was annoyed EVERY time I did P.E. (which was a lot) as I had to go all the way to the office and do a blood glucose test. If I was alright then I would go to P.E. but if I was lower than 12 I had to eat something before. Unfortunately I didn’t always know where P.E. was, it could have been the hall, the field, the upper school playground, the lower school playground, the millenium garden or even the running track. So I would have to visit every single one of those places and sometimes by the time I had almost visited them all, the class would have finished P.E. and be back in the classroom getting changed! Here is a list of questions I wrote on my pad within the first 24 hours of being diagnosed. Will I have diabetes forever? They told me straight away that I would. Will I need insulin for every meal? Yes, I would need to take insulin with every meal and also take some other insulin before bedtime. This question is discussed in the article ‘Does this mean I can’t go to India anymore?‘. Will I spread diabetes by hugging someone? Will I spread diabetes by kissing someone? Will I always need to do lots of blood sugar tests or is it just because I’ve just been diagnosed? Yes, it’s best to always test your blood sugars often. Why do I need to take two different insulins? One acts quickly and is for the meals you eat and the other one which you take at night lasts longer. I had been off school sick in early December, away from my friends who I missed. But it was only a horrible cold and I was sick once or twice. It was nothing to worry about, soon I’d be okay and back at school again. I’ve always been pretty rubbish at knowing when I needed to go to the toilet but it was getting worse. I was getting really, really, really thirsty and ended up downing pints of water to try and quench my thirst but nothing seemed to work. The more I drank the more I went to the toilet and I remember noticing that there was no colour at all to my wee. But I don’t remember this happening at school at all, which is strange seeing that I was there for two weeks after I was ill and the Doctors say that the early December illness probably caused the problem with my pancreas. Perhaps there’s a delay. We broke up from school for the Christmas break. I love Christmas because I get to have fun decorating the Christmas tree and seeing all of my family and I’ve got lots of them to see. I love the celebrations, the family ones and the chocolate ones. We’re allowed to stay up later, things are more relaxed, we can snack on chocolates if meals are a little later than normal. When I wanted a drink I’d get it myself, I’d even have my favourite Fanta if there was some in the fridge. It was great. After Christmas I went shopping with Mummy and before I went out I remember saying “can I take a bottle of water with me” and Mummy said “don’t bother we won’t be that long”. But I did need it, I knew I’d need it and I was right. Why didn’t she listen to me? We’d only been at the shops 5 minutes and I needed the toilet so I went into McDonalds and used theirs. After coming out I complained I was thirsty and asked “can I have a drink”. Mummy said “but then you’ll need the toilet again”. I didn’t get that drink. We went into Iceland and I saw a pack of fruit juice and pleaded for them. “No”. “No”. “Alright then if you’re really that thirsty”. I opened it immediately after we’d paid for it and drank it. Then I asked for another. I didn’t get it. The next morning Mummy woke me up and told me I had to go to the Doctor’s at 10am. At the Doctor’s Mummy explained about the drinking and toilet visits. He pricked my finger and took some blood which he tested but he didn’t really say anything. There was lots of words, I didn’t understand any of them but I didn’t think it was serious as Doctors just give you medicine which you take for a while and then you’re better. I heard the word ‘diabetes’. I think that’s the first time I heard the word directed at me. I thought about my Grandad who I knew had diabetes and I knew it just meant that he couldn’t quite eat as much cake as he’d like to. I didn’t know there were different types. The Doctor said he’d phone the hospital and they’d call us if needed. After the Doctors I went to one of my friends to tell her that I might not be able to come to her party and I gave her the present I’d bought her. When I got back Daddy told me that I had to go to the hospital at 3pm. It was only the second time I’d been to Winchester hospital. I don’t remember the first time as I was only 1 second old – I was born there. I wasn’t worried at all. Hospitals didn’t worry me. Sophie’s Place seemed really friendly and so did the people. They measured my height and weight and sat me down in the childrens’ in-patients area where they took my blood pressure. It still didn’t seem very serious and I felt quite calm. We went into a room and a nurse came to see us. She said she was very sorry but I had diabetes and I would need to take something called insulin. I didn’t know what it meant but it didn’t seem very serious. She asked if I had any questions. “Will I have this for the rest of my life?”. “Yes, I’m afraid you will”. I started thinking that this might be serious. I felt gutted, worse than gutted, the rest of my life! I remember looking at Daddy who looked really sad. They told me they needed to take some blood and then left. They seemed to be gone for ages. I started crying with fear of the needle. They put something called a canula in my arm but before that they put on some cooling spray which really hurt. The canula didn’t hurt as much. It was dinner time. The nurse told me I needed to have some insulin and we all did some practice injections on a stuffed case. Then she asked me who I wanted to do the injection. I said this because I was scared that if Mummy or Daddy did it and it hurt then I wouldn’t be able to do anything about it. The nurse had said that the pencil case would be tougher to pierce than my skin and I was worried that Mummy or Daddy would do the injection too hard and it would hurt me. If I did it, I’d be in control and I could do it as softly as I could. It didn’t take me very long to do the injection. I didn’t hesitate even though I didn’t know how much it would hurt me. I just wanted to get it over and done with. I didn’t have any pyjamas, I wanted my teddies and Mummy didn’t have any food so Emilia and Daddy went home and to the shops. They gave me my dinner, there were six Smilies and loads of other stuff. At home I only ever get 3 Smilies. I’d always wanted to stay overnight in hospital but not this way, but 6 Smilies! Hospital didn’t seem so bad. Nanny and Grandad came over to look after Emilia and Daddy returned with some food for Mummy and some new pyjamas for me which Emilia had chosen. Soon it was time for bed and Daddy left. Afterwards I cuddled Mummy and cried, a lot. Mummy and I settled down to sleep a little before they woke me up, as they said they would, at 2:30am so I could do another blood glucose test. We went back to sleep.